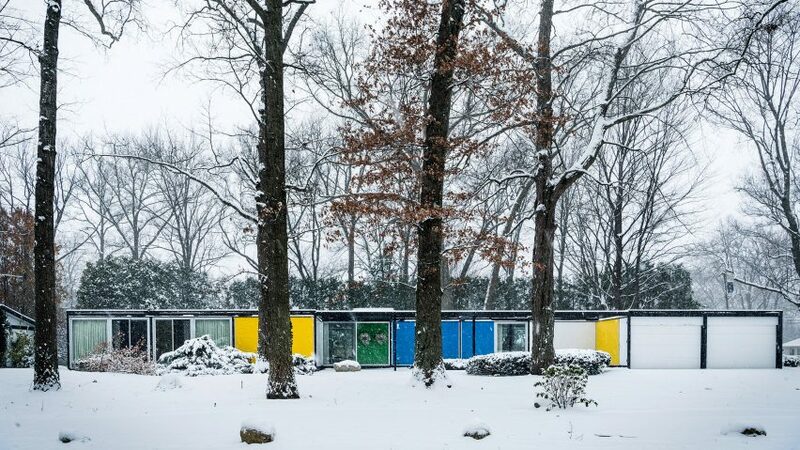 A 1960s prefabricated dwelling in northern Indiana has been preserved by Karen Valentine and Bob Coscarelli, who purchased the home without ever seeing it in person. The Frost House is located in Michigan City, a town along Lake Michigan where many Chicago residents have summer homes. Other notable architecture in the area includes several "Century of Progress" homes that were exhibited at the 1933 Chicago World's Fair. Valentine, a talent strategy executive, and Coscarelli, a commercial photographer, purchased the residence in 2016 from original owners Dr Robert Frost and his wife, Amelia, who were in their 90s at the time. Valentine and Coscarelli have since spent considerable effort researching the house and even created a website for it. 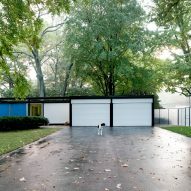 Built in 1964, the three-bedroom home was designed by Emil Tessin, a MIT graduate. It was one of 22 prefabricated models conceived by the Alside Homes company, all of which featured steel framing with glass and aluminium panels. Buyers could select from a range of special features, including carports, basements, fireplaces, screened-in porches and furniture packages. The homes came with exposed steel that was painted black, and aluminium panels that were faced with baked-enamel offered in 41 different colours. 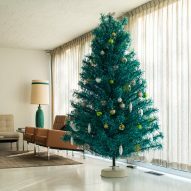 The Frost House features a mix of canary yellow, bright white, peacock blue and kelly green. "You can see the influence in the home from Case Study Houses, notably the Eames House and the homes designed by Craig Ellwood and Pierre Koenig," said Valentine, noting that they also see references to the work of Ludwig Mies van der Rohe. "We joke that our house is the IKEA version of the Farnsworth House." When Alside launched its line of prefab homes, it aimed to provide mass-produced housing at an affordable rate. But the company encountered two major problems, according to Valentine. For one, the American Midwest was a relatively conservative market, and the homes were only available within a 600-mile (965-kilometre) radius of Ohio. Second, the cost of materials skyrocketed. "From the time the homes went into production, there was a steep rise in the cost of the raw materials, making the homes cost-prohibitive," said Valentine. "Alside invested $7.5 million into the production of the prefabricated houses, but after 10 months of sales, they shut the project down." "It is estimated they sold somewhere between 96 to 200 of the homes," Valentine added. "So far we have located 29 of them, some of which are no longer standing." Valentine and Coscarelli never intended to buy an original mid-century modern home. Initially, they were hoping to build a custom home, or to buy and renovate a little cottage, but their realtor urged them to consider the Frost House when it landed on the market. "We put in an offer without even physically seeing the house," said Valentine. "Our realtor took us on a walk-through via Facetime." Once they saw the house in person, they decided to minimise their interventions and take a preservationist approach. "We knew we wanted to preserve this time capsule – it was too perfect to touch," they said. "Changing the house in the condition it was in would be the equivalent of buying a Piet Mondrian painting to reuse as a canvas." The owners installed a new roof, but otherwise left the building envelope untouched. A pool was added to a side lot, along with a steel and polycarbonate fence that was designed to look period-appropriate. In order to ensure the additions were aesthetically sensitive, the owners enlisted the help of landscape designer Julie DeLeon of Groundwork. Inside, the home's layout was left intact. "The flow of the home and the layout of the rooms were ahead of their time," said Valentine. "Everything made sense and the rooms were all perfectly sized." 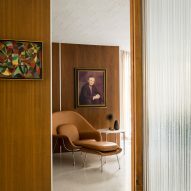 The owners retained all of the original Knoll furniture and curtains, along with the built-in cabinetry by noted industrial designer Paul McCobb. Distinctive elements include wall-hung toilets in the bathroom, a refrigerator with an ice maker, and a food processor with attachments built into the kitchen island – all of which are still in use. "The home was a sales model and the original owners purchased it with all the sales model furniture, which we still have in the home today," explained Valentine. Nine different floor coverings were found throughout the dwelling, some of which were worn or water-damaged. Carpeting in the common areas was replaced with terrazzo tiles, which mimicked original tile that was used for patios and a basement entryway. In the bedrooms, the owners installed wool carpet. "We went with wool because the majority of the interior walls are aluminium, and we didn't want anything with synthetics that would create too much static electricity in the winter," they said. Other changes were minor. The owners rearranged certain pieces of furniture and artwork. 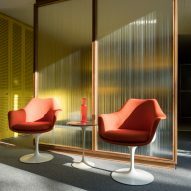 A small amount of new decor was added, most of which was manufactured by Knoll. "We basically moved in and filled the kitchen cabinets with serving ware, dishes, glassware, pots and pans," they said. "We brought some clothes and bedding – and got straight to living in the house." Also in Indiana, a low-lying 1950s home was recently renovated by design studio Haus. The project involved adding a multipurpose room, new cladding and a moss garden. Photography is by Bob Coscarelli.